To make my Mexican Salsa Verde, I like to char roast the tomatillos, chilies and garlic, bringing out their inherent sweetness while imbuing a wonderful smoky flavor. 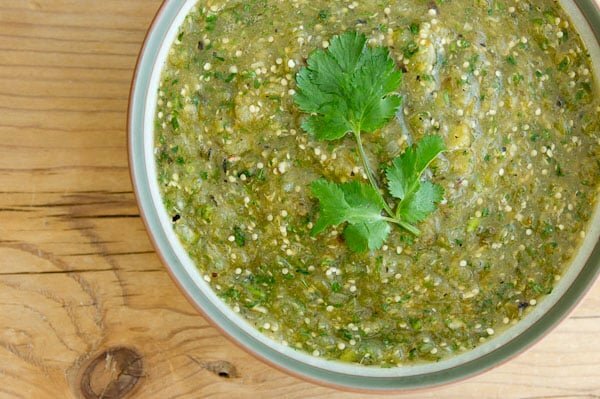 Combined with some fresh minced onions, cilantro and lime juice, you won't be able to stop eating this Salsa Verde until all the chips are gone. Oh the things I go through to get a descent photo for the website… Let me start from the beginning… I made a batch of salsa verde last week to go with some tacos, but having had a few cervezas on an empty stomach, the tacos and salsa were demolished before I had a chance to take a photo of the salsa verde by itself. Oops! I tend to prefer salsas made with tomatoes for chips, but as a condiment on tacos, eggs, etc, I’m a huge fan of this green tomatillo salsa. It’s tangy, sweet and spicy with some very concentrated flavours owing to the fact that everything gets fire roasted before it goes into the salsa. You could of course use canned tomatillos, but given how widely available the fresh ones are here in North America, there really isn’t any excuse to not use fresh ones. Move the oven rack to the top position and turn on the broiler. Lay down a piece of foil onto the rack and turn up the edges to prevent juices from running off. Place the tomatillos, chili and garlic on the foil and broil until the skins charred. Flip everything over and char the other side. Remove everything from the oven with the foil, being careful not to spill any of the liquid. Remove the core excess char from the tomatillos and mince with a sharp knife. Mince the chili and garlic and add to a bowl with the tomatillos. Add the lime juice, onions and cilantro then salt to taste. The things we do for our blogs! Thanks for sharing your wonderful green salsa recipe! It’s funny what a few drinks and a very hungry belly can make you do… especially when there’s delicious food calling your name. The camera didn’t even have a chance. Anyway, the salsa looks great, and you are so resourceful to just make your own chips! LOL! so true Marc. there are tons of recipes which I make so regularly and for variety of reasons don’t end up on my blog – mostly becoz of my laziness. 🙂 the salsa verde looks yummy. I have a bunch of tomatillo seedlings growing so I hope to be making salsa verde soon. A single tortilla. You are truly dedicated, Marc. This looks great! I have a bowl of salsa verde in my fridge, but it’s from a can. The colour’s completely different. Yours look so much more vibrant! I like that your tomatillos take center stage–I usually make them share the spotlight with some cubanelles or other mild green-tasting peppers. You win the Dedicated Blogger Award for the whole make-a-chip scenario! That shows dedication to make a fresh tortilla just for your photo shoot. It also shows dedication of another kind to consume all of your food (and cerveza) before you know what happened. I tried to grow some tomatillos from seed, but unlike Holly none of mine sprouted (or I killed the sprouts – I’m prone to that). You’re right, though, that tomatillos are very readily available, and not bad for flavor. Good thing! That’s funny. I’ve gone through every clean plate in the house trying to get something to look presentable. Anything for the blog! That’s great that we both posted about salsa verde on the same day! Different origins for the salsas, but still. Marc, thanks for sharing this recipe. It took me back to a place in Boston I used to go to called Anna’s Taqueria. It had great salsa verde for a ‘chain’ store. I miss that place so will have to try this to recreate the memory! I love using tomatillos for salsa, and will often combine with tomatoes, red onion, sweet peppers, etc and maybe a little rice or apple vinegar — so good on toasted bread. I haven’t roasted my tomatillos first — sounds like more work, but would impart a nice flavor! 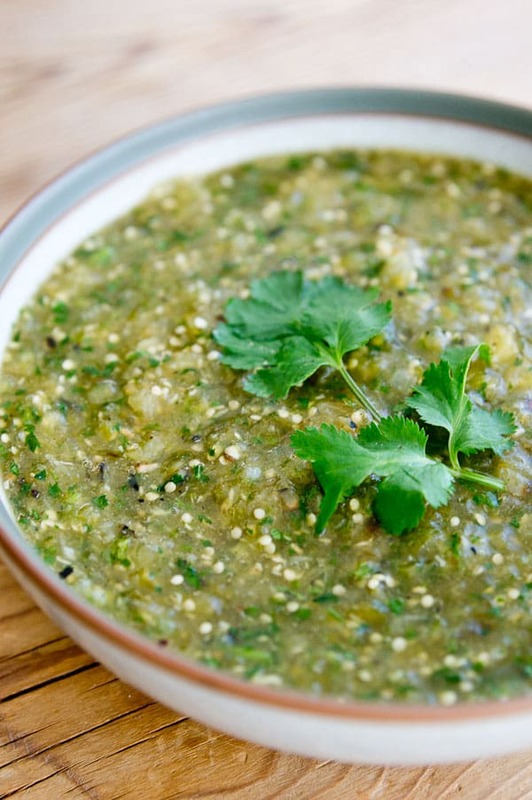 Salsa verde is so simple and yet so addictively good! Making the chip for the blog? Of course. That is our art. My favorite breakfast when traveling Mexico years ago was a scrambled egg, with all things green: salsa verde, avocado, cilantro, sliced jalapeño. Continues to be my all time favorite breakfast. great recipe …am going to buy tomatillos just to try this one! I just made this…..tomatillos are in super store now……I bought some…..
how long does this salsa last in the fridge? Thanks! 4-5 days provided you don’t double dip and keep it in a sealed container. Abuelo’s salsa verde is suprisingly delicious! It is made just like this but has fresh pineapple in it. It is so fresh! What do you do when the salsa gels after it has been in the fridge?? I don’t think I’ve ever had it do that. Have you tried stirring it? Great recipe! I added an extra Serrano and jalapeño for an extra kick. Delicious!! Thank you! This would work great for an awesome pork chile verde.